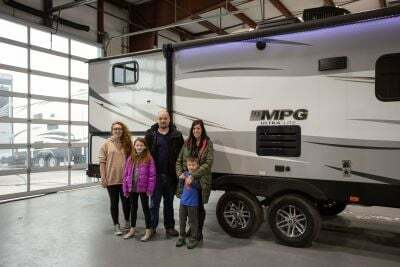 Start planning out your future adventures with the 2020 Keystone Fuzion 373! 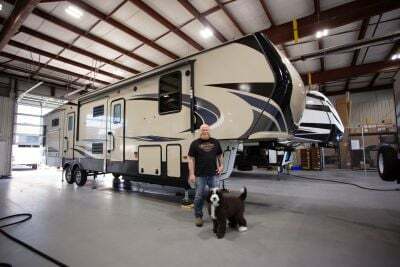 You can find this 5th Wheel Toy Hauler and other great models at Lakeshore RV Center! 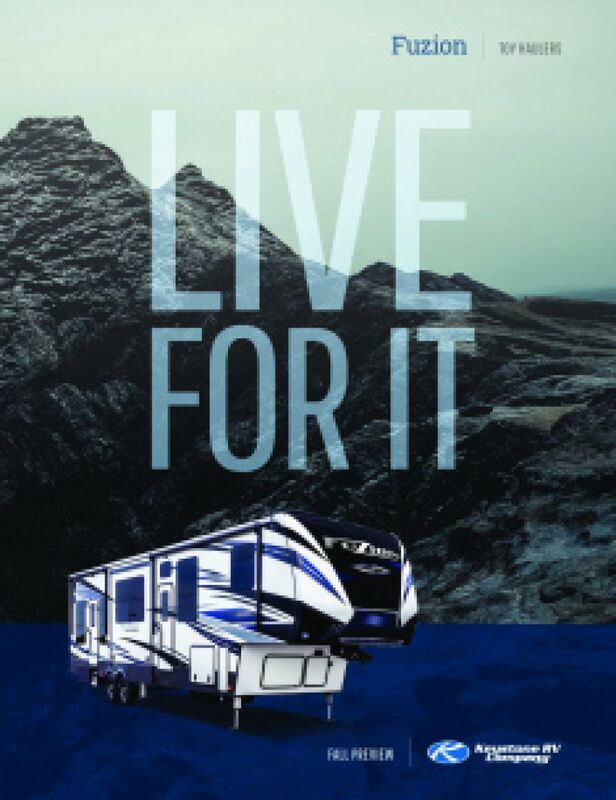 With the nation's lowest prices on all models, we rank as the number one Michigan RV dealer! 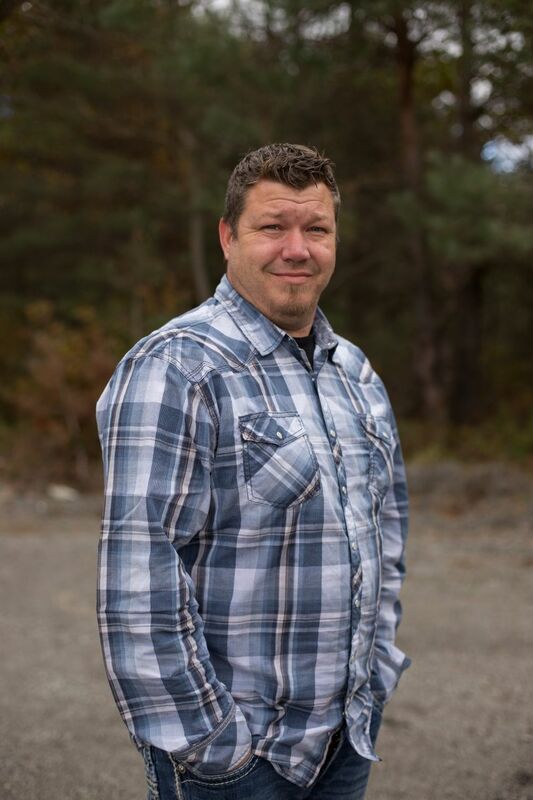 Stop by 4500 E Apple Ave Muskegon Michigan 49442 or call us at 231-788-2040 to learn more from one of our RV experts! Enjoy nice family meals with the help of this model's fully equipped kitchen! Dishes can be scrubbed and cleaned with plenty of water from the 106 gallon freshwater tank. Stock up on fresh food with the 18.00 cu. ft. refrigerator and cook family-sized meals with the 3 burner range cooktop! 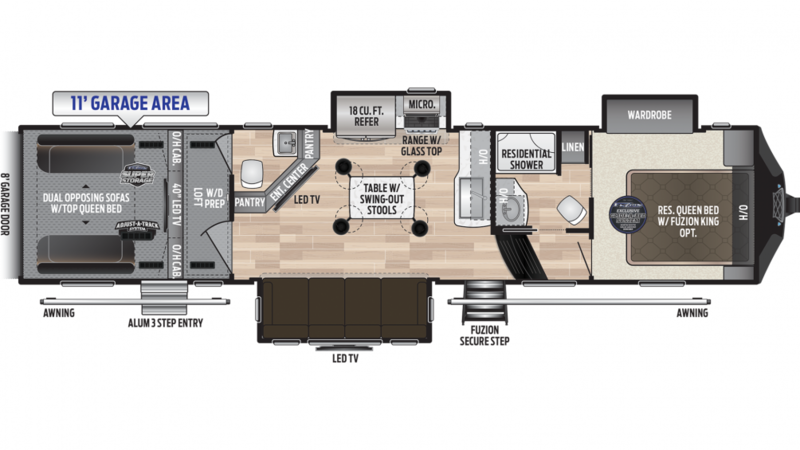 You'll have the convenience of a shower and a Porcelain Foot Flush toilet wherever you go with this RV's bathroom! With 60 lbs. of LP tank capacity, you'll be able to have long, hot showers every morning! You'll have somewhere hidden to store your waste with the 88 gallon gray water tank and the 88 gallon black water tank! The campground is more fun when you bring your favorite toys! They'll fit nice and easily in the easy-access 11' 0" garage! This toy hauler has an impressive cargo capacity of 2955 lbs, so even your heaviest toys can come with you on your outdoor adventures! The half bathroom is a real boon! When a family member or guest is indulging in a leisurely shower, tying up the master bathroom, you won't have to pace back and forth gritting your teeth, or hotfoot it through the campground to the damp, chilly, messy public bathrooms! Instead, you'll have access to a full sink vanity and a convenient Porcelain Foot Flush commode, so relief is always just a few steps away.